The biggest meat-eating mammal ever to exist on Earth is alive and well today, but it doesn't strike fear in the hearts of men quite like some smaller meat-eating creatures such as the lion, bear or wolf. Perhaps that's because it has never been known to hunt humans -- or any creature bigger than a mouse. Without dispute, the blue whale is the largest meat-eating mammal ever to exist on the planet. At up to 100 feet long and weighing 200 tons, it has a larger body and weighs more by far than any other mammal. The blue whale is a carnivore that eats krill, which are tiny shrimp-like creatures. Even at birth, a young blue whale is still the largest meat-eating mammal. Newborns start out at around 25 feet long and weighing 3 tons, gaining around 200 pounds each day during their first year of life. The blue whale is on the World Conservation Union's endangered list. Only one skull has ever been found, but based on its massive size the extinct Andrewsarchus is believed to have been the largest carnivorous land mammal ever. Scientists think that this giant creature had a body shaped like a wolf, cloven hooves and an extraordinarily long snout. It may have looked similar to a very large wild boar. Regardless of its exact appearance, the skull indicates that this beast, which lived between 36 million and 45 million years ago, was more than 16 feet long, stood 6 feet tall at the shoulder when on all fours, and weighed more than 1,500 pounds. The skull alone is nearly 3 feet long. While the blue whale certainly dwarfs the southern elephant seal in both length and weight, most people don't get an opportunity to see this giant in the wild. A whale also doesn't fit the stereotypical image of a meat-eating mammal. A seal might not fit that image either, but with the exception of the whale, the southern elephant seal is the largest meat-eating mammal alive today. These seals weigh up to 6,600 pounds and reach more than 16 feet long from nose to tail. This massive size is due in part to the fact that a southern elephant seal can have a body composition of nearly 50 percent fat or blubber. On land, the largest meat-eating mammal in existence today is the bear. There is some difference of opinion as to which is the largest, the polar bear or the Alaskan brown bear, also known as the Kodiak. 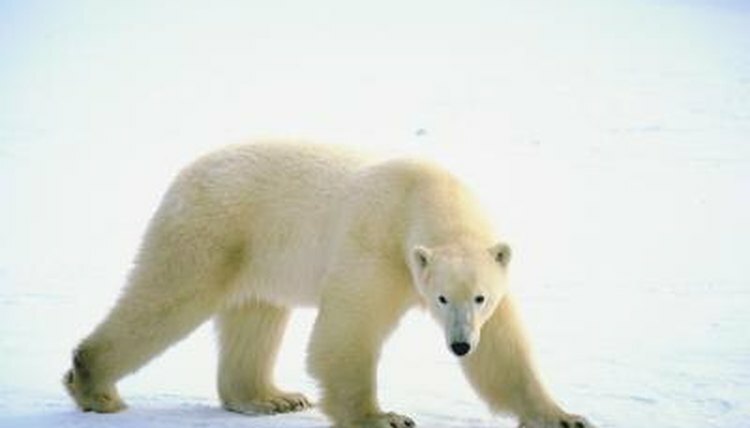 The polar bear's body length is smaller on average than the Kodiak, with polar bears averaging around 8 feet and Kodiak bears regularly reaching 10 feet; however, the polar bear commonly weighs between 900 and 1,500 pounds, while the Kodiak is smaller at 500 to 900 pounds.